Uluru: where camel is the new skinny – These Two Eyes! I’m out of breath. My heart is racing to the point that I think it might even be boiling. It’s 106 degrees Fahrenheit and I’m standing in dry heat in the center of Australia. Red dirt, green bush and flies. Oh, the flies. What seems like millions of them buzzing in my ear, my nostrils, my eyes. I can’t keep my concentration or focus on the incredible Walpa Gorge in Uluru-Kata Tjuta National Park because of the constant buzz. I’ve only been off the plane for less than an hour and the green fly net covering my face has become my new favorite accessory. I’m awake at 5:20 am on day 2. We hike through the long grass up to Imalung Lookout to watch the sun rise over Uluru. It’s pretty magnificent. By 8 am we’re at the base of the enormous rock to join park ranger Steve for the free Mala walk. Steve shares with us stories about aboriginal culture and introduces the fauna and wildlife. He’s passionate yet I also sense bitterness over the much controversial topic of climbing the rock. This guided walk is one of the few free things to do but it’s slow and ventured over 2 hours so we escaped before the end. By 10:30 am the sun becomes intense. We hire bikes and begin the 10.5k ride around the base of the rock. By 11 am the tracks have all been closed off for the day because of the heat. About half way through my thoughts get the best of me. The heart boiling sensation returns and I attach my mouth to the Camelback resting in my bike basket like an umbilical cord. There’s no giving up though. We’re literally in the outback with no one else around. There is no escape route or emergency eject button. By the time we’ve returned I’ve coined Ayer’s Rock Resort a decrepit Disneyland. Sun faded, run down with nowhere else to go. I’m hungry and feel trapped. It might be the Melbourne food snob in me but I’m completely underwhelmed by my options. The wallaby shank from the more upmarket restaurant Bough House was average and the noodles from Ayer’s Wok were bland yet cleverly marketed. Luckily we brought some decent chardonnay with us and snagged some crumbled aged cheddar from the grocery store to treat ourselves back in the hotel room. It’s been a long day but there is still one more thing on the agenda, a camel ride to view the sunset over the Olgas. Jesse and I get paired up with Tas, one of the smaller camels from the group of eight roped together in a conga line. We were greeted with a good-humored safety briefing and were educated throughout the 1-hour ride on camel back. I learned that Australia is home to the largest population of wild camels in the southern hemisphere and the only feral camels left in the world. 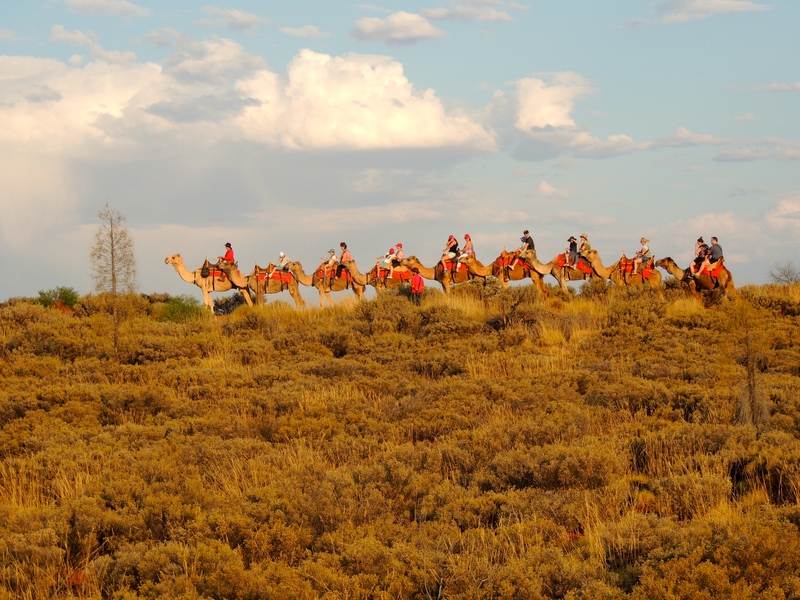 The exact number of wild camels is unknown but they guess anywhere from 500K to a million. In fact, Australia exports its camels to the Middle East. Camel meat is full of protein and I’m anticipating it will be the new fad diet to join kangaroo and crocodile. Camel burgers truly are the new skinny. Just as the sun was setting we stopped propped up on a hill to witness the beautiful hues change from blue to orange and then dusk hit. Pete, the large camel tied behind Tas kept giving Jesse kisses and snuggles. Once back at the ranch we were given the most delicious damper (bread) and a healthy offering of beer and wine. This tour was my most anticipated part to the trip and I applaud Uluru Camel Tours for exceeding my expectations. Unfortunately, I can’t say the same for the 4-hour delay we had at the airport the following day on our return to Melbourne. To visit Uluru, one of Australia’s most iconic destinations, was definitely a bucket list item I’m so proud to have ticked.